Part of my life goal has always been to exercise both the right and the left sides of my brain (as business and creativity do). I love not having to choose. You may have heard the phrase, “you can’t do it all,” and while there may be some truth to that, Jen Bilik is one of many design entrepreneurs who does do it all, and does it well. 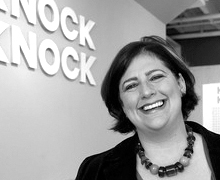 Jen is the founder, owner, and self-prescribed “head honcho” of Knock Knock, the irreverent stationary and gift company, launched in 2002. The 10-year old company has grown from a line of a few cards with witty punchlines, to a multi-million dollar company that produces over 200 products a year for small boutique shops and major retailers like Target, Urban Outfitters, and Costco. We love that last line, and frankly, it sums up pretty well what we’re trying to do with Kern and Burn.